The countries that believe they are the world leaders in democratic fairness are in fact fooling themselves into a false belief their system delivers the “will of the people” when it is heavily weighed to deliver the status quo. Keeping a momentum going for a bit too long is selected instead of cutting short potential. The current era of economic liberalism was delivering a return based on an inflating fiction up until the 2008 crash, as investors optimism evolved into the unfulfillable hunger of a flaccid market, devoid of long term growth through conventional means, i.e. where common production and consumption supporting long term growth. The market roared into a cliff edge – why would anyone believe that our accounts are now in the red but with ten zeroes after the number? The need for a Commonwealth is apparent in advanced societies. The needs of the majority start to become a more agitated policial force as deception is unmasked. In the USA, the Senate is comprised of two Senators for each State. Some States have vastly more people than others. How are they equal? The President is a product of votes by arbitrary numbers of Electoral College votes that are supposed but not guaranteed to reflect the decision of the voters of that State. 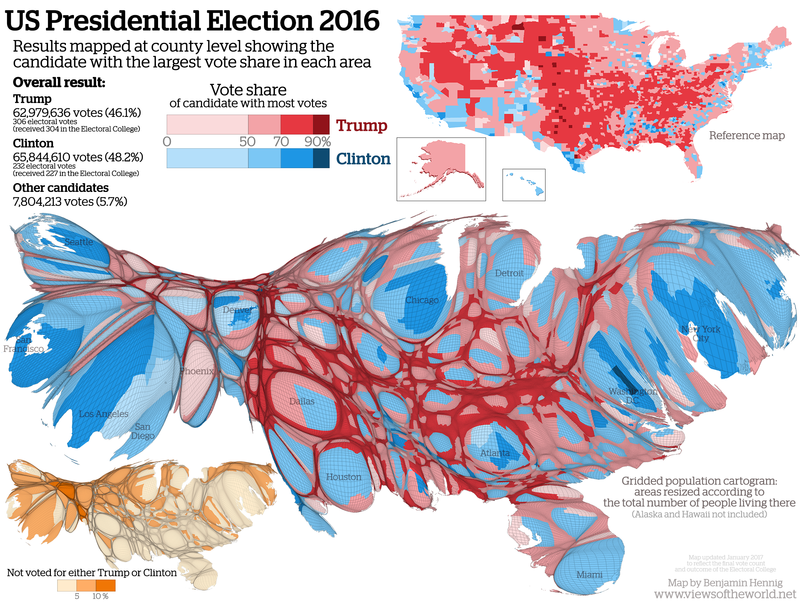 It seems hard to find a map comparison of the electoral college and the population levels but this cartograph shows the relativity of voters by number in a distortion of the land they occupy (from . This is not meaningful in a democracy. America is not a democracy, it is representational. We support a general direction by voting for one or another of two dominant political memes. Only two? Yes. And then the choice is not one of a plebiscite but one where the resources controlled have a say. Where influence has sway. It is a strange value – but reflects the British use of “electorates” with boundaries potentially redrawn by the Government. Actual democracy would be a threat to the status quo. It remains that genuine economic direction is established by engagement of the actual majority rather than how we fool ourselves letting privileges guide us. Privilege gets old. Here is an excellent range of maps to explore how undemocratic America can become. The electoral college does not select based on the popular vote but by a contract of mutual benefit of each state. It made some sense in terms of economic stability until they elected a backward looking president that reboots the coal industry and bans abortions while scientists calmly try to explain that climate change and human growth are threatening the very continuation of life on this rock in space. Trump probably won’t succeed at being the Antichrist, the world is not going to end in flames, but as a sigh. An exhaled breath that dissipates.